In the event of a collision, the air bag control unit will not allow front passenger front air bag deployment when the OCS has classified the front passenger seat occupant as weighing as much as or less than a typical 12-month-old child in a standard child restraint or if the front passenger seat is classified as being empty. illuminate when the engine is started and remain illuminated. This indicates that the front passenger front air bag is deactivated. when the engine is started and remain illuminated. This indicates that the front passenger front air bag is deactivated. front passenger front air bag is deactivated. front passenger front air bag is activated. illuminate for approximately six seconds when the engine is started and then go out. This indicates that the front passenger front air bag is activated. illuminated, the front passenger front air bag is deactivated and will not be deployed. According to accident statistics, children are safer when properly restrained on the rear seats than on the front-passenger seat. Thus, we strongly recommend that children be placed in the rear seats whenever possible. Regardless of seating position, children 12 years old and under must be seated and properly secured in an appropriate infant restraint, toddler restraint, or booster seat recommended for the size and weight of the child. The infant or child restraint must be properly secured with the vehicle's seat belt, the seat belt and Top Tether strap, or lower anchors and Top Tether strap, fully in accordance with the child seat manufacturer's instructions. Occupants, especially children, should always sit as upright as possible, wear the seat belt properly and use an appropriately sized infant restraint, toddler restraint, or booster seat recommended for the size and weight of the child. • Your vehicle is equipped with air bag technology designed to deactivate the front-passenger front air bag in your vehicle when the system senses the weight of a typical 12-month-old child or less along with the weight of a standard appropriate child restraint on the front-passenger seat. • A child in a rear-facing child restraint on the front-passenger seat will be seriously injured or even killed if the front-passenger front air bag inflates in a collision which could occur under some circumstances, even with the air bag technology installed in your vehicle. The only means to eliminate this risk completely is never to place a child in a rear-facing child restraint in the frontpassenger seat. We therefore strongly recommend that you always place a child in a rear-facing child restraint on the rear seat. indicator lamp goes out or remains out, do not transport a child on the front-passenger seat until the system has been repaired. A child in a rear-facing child restraint on the front-passenger seat will be seriously injured or even killed if the front-passenger front air bag inflates. - secure child restraint with the vehicle's seat belt according to the child seat manufacturer's instructions • For children larger than the typical 12- month-old child, the front-passenger front air bag may or may not be activated. indicator lamp light up simultaneously, the OCS is malfunctioning. The front passenger front air bag will be deactivated in this case. Have the system checked by qualified technicians as soon as possible. Contact an authorized Mercedes-Benz Center. Only have the seat repaired or replaced at an authorized Mercedes-Benz Center. • Sit with the seat belt properly fastened in a position that is as upright as possible with your back against the seat backrest. • When seated, a passenger should not position him/herself in such a way as to cause the passenger's weight to be lifted from the seat cushion as this may result in the OCS being unable to correctly approximate the passenger's weight category. • Read and observe all warnings in this chapter. The Occupant Classification System (OCS) categorizes the occupant on the frontpassenger seat using a weight sensor. The front-passenger front air bag is deactivated automatically for certain weight categories. front-passenger air bag is disabled. The OCS weight sensor reading is affected if the occupant's weight is transferred, e.g. by leaning on the armrest. If the front-passenger seat, the seat cover or the seat cushion are damaged, have the necessary repair work carried out at a qualified specialist workshop. For safety reasons, Mercedes-Benz recommends that you only use seat accessories that have been approved by Mercedes-Benz. indicator lamp to determine whether or not the front passenger is positioned correctly. Also observe the air bag display messages, which appear in the instrument cluster . If the driver's air bag deploys, this does not mean that the front-passenger front air bag will also deploy. The OCS may have detected that the seat: • is empty or occupied by the weight of a typical child up to twelve months old, seated in a child restraint system • is occupied by a small individual, such as a young teenager or a small adult • is occupied by a child in a child restraint system whose weight is greater than that of a typical twelve month old child. These are examples of when the OCS deactivates the front-passenger front air bag. Deactivation takes place although the collision fulfills the criteria for deploying the driver's air bag. illuminate, the system is not functioning. 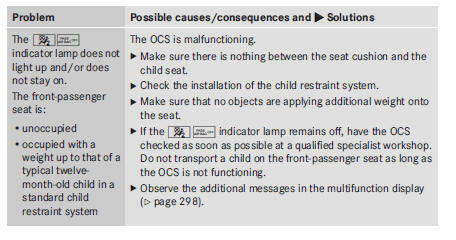 You must contact an authorized Mercedes-Benz Center before seating any child on the front passenger seat. Never place anything between seat cushion and child seat (e.g. a pillow), since it reduces the effectiveness of the OCS. The underside and rear side child restraint system must be placed entirely on the seat cushion and the backrest of the front-passenger seat backrest. If necessary, adjust the tilt of the passenger seat backrest. An incorrectly mounted child seat could cause injuries to the child in case of an accident, instead of increasing protection for the child. Follow the manufacturer's instructions for installation of child restraint systems. indicator lamp will not go out. For more information about the OCS, see "Problems with the Occupant Classification System" . illuminates and remains illuminated when the weight of a typical adult or someone larger than a small individual has been detected on the passenger seat, do not allow any occupant to use the passenger seat until the system has been repaired. illuminate or remains out with the weight of a typical 12-month-old child in a standard child restraint or less, or is unoccupied, on the front-passenger seat, do not transport a child on the front-passenger seat until the system has been repaired.